It’s no secret my was fond of fancy, electronic gadgets. He’d pore through the likes of Williams Sonoma, various restaurant supply catalogs, that weird Vermont one that had union suits, bag balm and old fashioned candy and fill out the order sheet. Often when a package arrived on the stoop he’d have forgotten his midnight purchase until, peanuts and packing tape piles later he’d coo with glee at a new industrial juicer, ice cream machine or seltzer shooter. One such item, new and fancy in its day was a Belgium waffle maker which I inherited and used a fair amount. But it was a pain to clean, had years of grime on it and started to smoke in an alarming way. So we ditched it a couple years ago and I’ve been missing it ever since. One day, like my dad, I got the idea to replace it and 15 minutes of research later the job was done and it would soon be on the way. 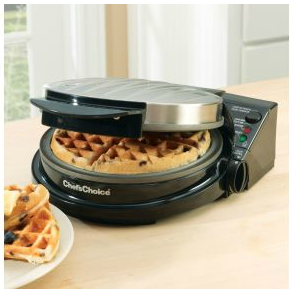 Thus entered into our lives the ChefsChoice WafflePro. Also like my dad, I don’t like to wait when I get something new. So, having arrived at 4pm, it meant we were having waffles for dinner. 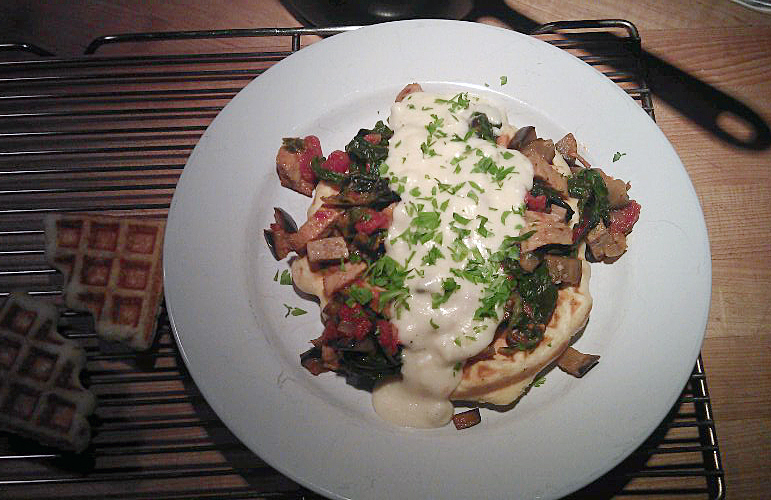 I recalled the savory waffles I’d had at City O’ City. They were a crisp outside, fluffy inside platform for a ratatouille glop and creamy, taleggio sauce. They were pretty awesome. Searching the fridge, pantry, freezer and garden I assembled a decent haul: rosemary roasted pork loin, can of fire roasted tomatoes, eggplant, onion, monterey jack, ricotta salata, parmesan, thyme, basil and broth. My daughter helped me follow the cornmeal waffle recipe that came with the waffle maker and we got to work. While it was heating up for the initial cleaning I sauteed some onions and garlic and eggplant, added the cubed pork, herbs, tomatoes and broth and made a thickened, soupy glop. I also made a simple cheese sauce with the various cheese nubs. Once we ditched the sacrificial waffle we were ready to go. I set the machine to “crisp exterior, moist interior” because that sounded great. In a couple minutes it beeped to tell me it was ready. We poured in 1/2 cup of batter, set the darkness to 4 and closed the lid. What seemed like just a couple minutes later it beeped again and we were soon snacking on a pretty decent waffle. I slathered some nutela on a piece since Audra had already eaten her dinner and we made a couple more. Ultimately we decided that if you are putting anything even slightly wet on the waffle, uniform texture made for a crispier, better waffle. And it seems that unless you are squishing a stuffed sandwich in the machine (which I do love to do) you are never just eating a waffle without something creamy, gooey, or wet. So much for that fancy sounding setting. The next morning we had a more typical waffles with bacon meal. I chose the kind of recipe where you beat the egg whites and fold them in for an even airier, crispier waffle. They came out quickly and hot and wonderful. The machine cleaned easily, the cord wraps up and it stores upright. I’m thrilled with the new addition to our kitchen and am looking forward to perfecting my batter next time. This entry was posted in Leftovers, My Favorite Things, Pork by Marina Chotzinoff. Bookmark the permalink. love Waffles! What a great meal on/in/around a breakfast basic.